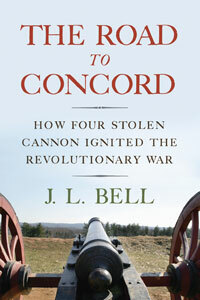 From The Curious Genealogist: Take a minute to click on the link to Bell’s blog Boston 1775 in green directly above. If you have any interest in history or Boston, you’ll probably be staying far longer than a minute. It will be time well spent. 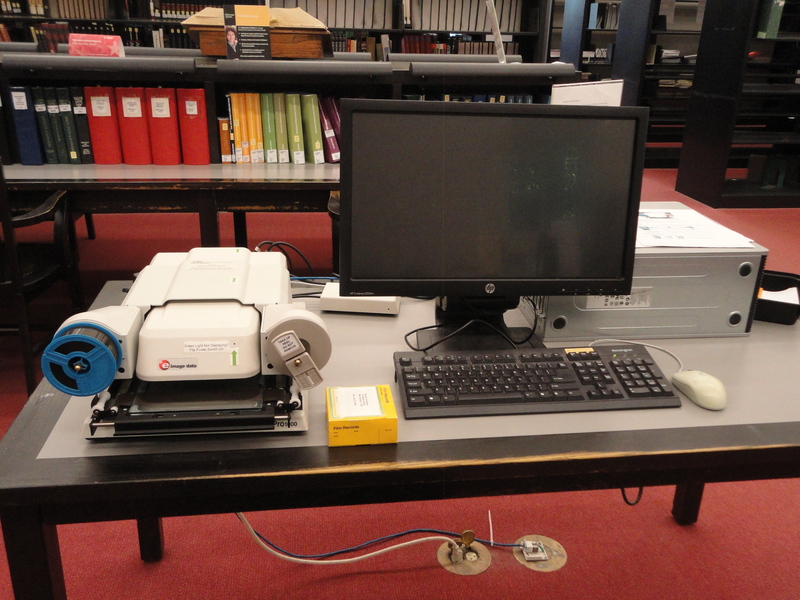 Are even the computerized microfilm readers obsolete? If the LDS microfilm loan program is any indication, the answer is yes. The above announcement comes directly from FamilySearch. For additional information and explanation, see Amy Johnson Crow’s Posting: The End of FamilySearch Microfilm Loans: What It Means to You. Most of us are familiar with high school yearbooks. We probably have at least one from our own senior year. They may be filled with signed comments from our fellow graduates, some funny, some not so much. … Going through them brings back all sorts of memories and can spark stories. You may have tucked graduation programs and other loose mementos into it that were important to you. 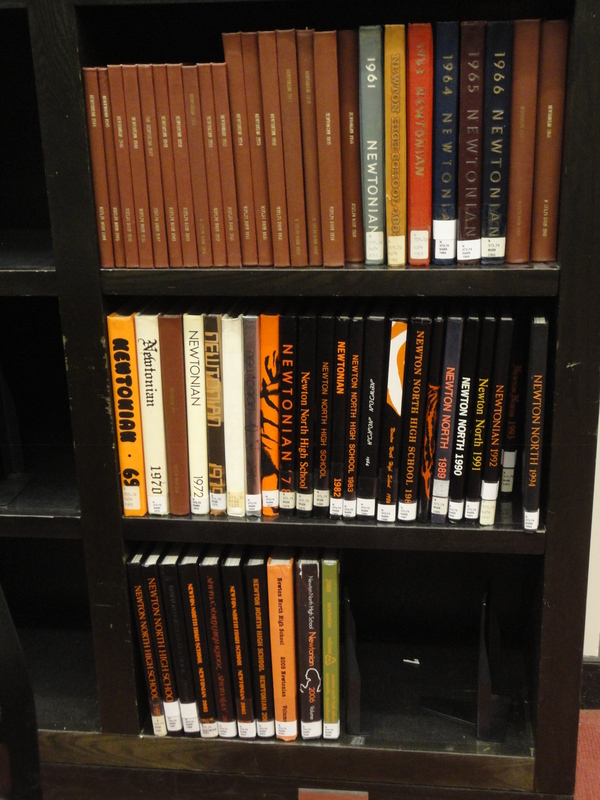 Collections of high school yearbooks in public libraries are potent resources that are used often and for various purposes. They can be consulted by reporters for news stories, checked by people writing biographies, searched by people looking for pictures of their parents or grandparents or for birth parents whom they have never seen. The yearbook with its acid-free archival case. What is it that sparks my current focus on yearbooks? A local high school is making available to our library whatever yearbooks we need or would like to add to our collections. A member of our reference staff, Kim Hewitt, is working with materials in our Special Collections room. In this capacity she visited the high school library to take a look at what it has. When Kim checked a copy of one 1937 Newtonian yearbook for loose ephemera, she discovered something extraordinary. 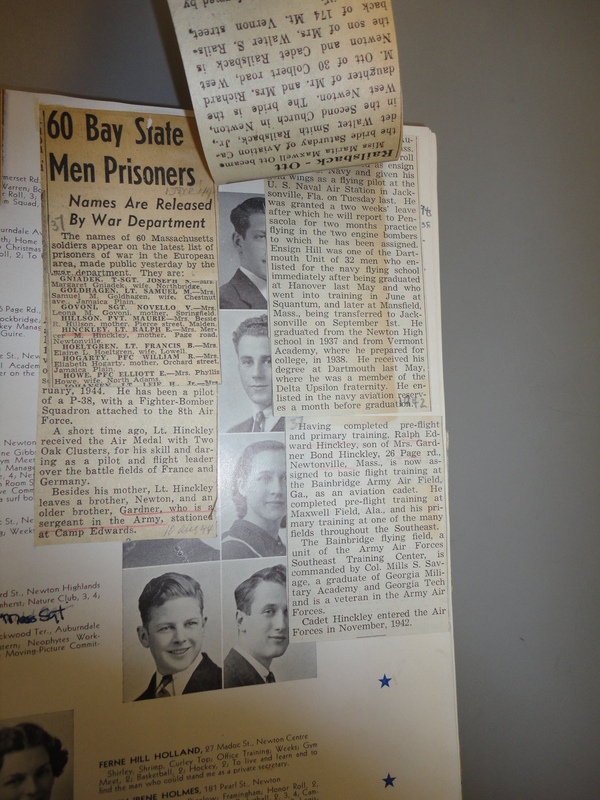 Someone had kept clippings about the graduates, especially those who served in World War II. On almost every page there were tipped-in newspaper articles about graduates pictured on that page, usually stories about their military service. Some described their current activities overseas. Some were death notices. The articles span events and battles over a number of years. Personal milestones, such as marriages, are the subject of other clippings. In short, it is a genealogist’s gold mine of information. If something has been “tipped in,” it means you can lift the material and see what’s underneath. 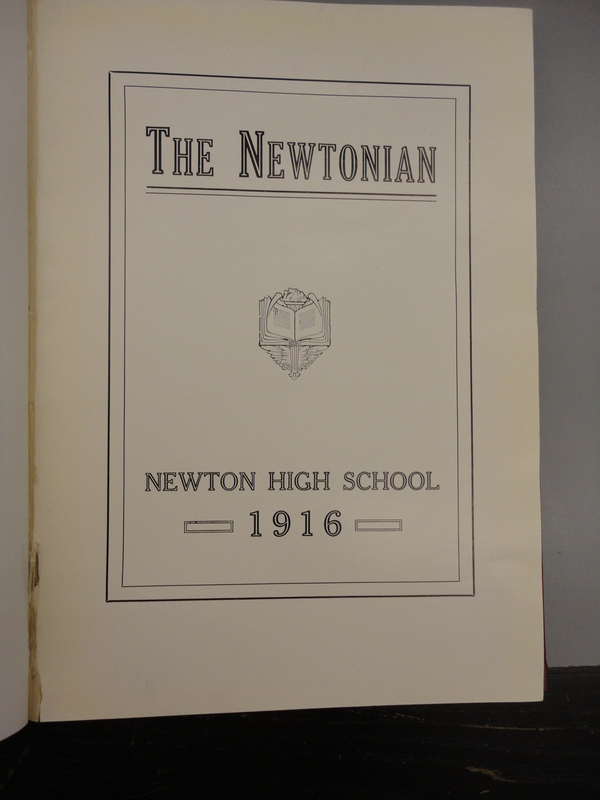 This yearbook has now become a part of Newton’s Special Collections. If you have a relative who graduated from Newton High School in 1937, it’s worth a look. If you are interested, its catalog title is “Newton High School Class of 1937 and World War II.” The call number is N 373.34 N38M. Clicking on the preceding title will take you directly to its entry in our online catalog. It does not circulate and must be used within the library. Compact Shelving with one opening. If you want to get into the first bay on the far left, all the other bays have to be moved forward. Since the 1937 yearbook mentioned above is so unique and also fragile, it will be kept in what is known as compact shelving, not on the open Special Collection shelving. 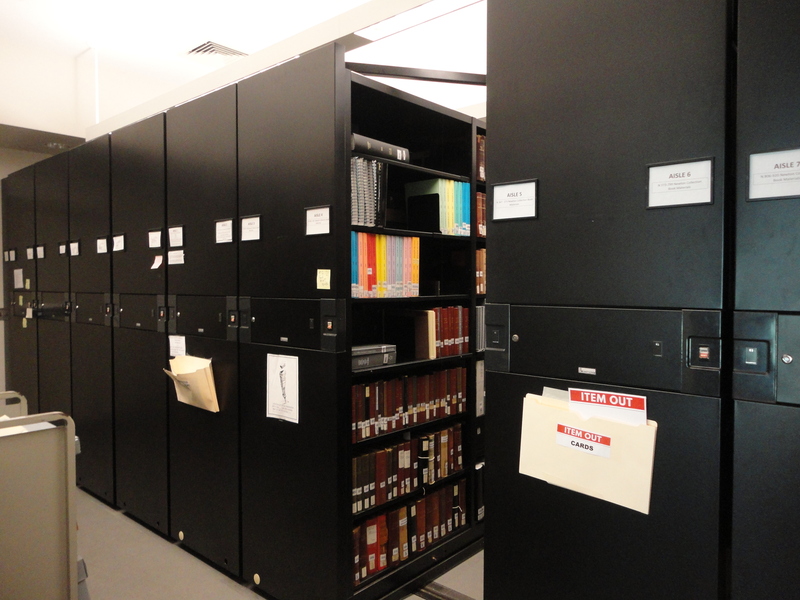 Using compact shelving saves a great deal of space but requires the movement of heavy shelving electronically. Newton’s compact shelving is run by machinery that is old and can be somewhat cranky. It needs two people to open it to retrieve material kept there. If you are thinking of coming in to look at this item, or other collections from compact shelving, it would help if you let us know in advance. If we know when you are coming, we can pull material for you ahead of time. Actually it’s always a good idea to plan ahead with any library you are visiting. Check in advance for any special restrictions or rules for viewing or copying fragile or unique material. What are the library’s hours? Do they change depending on the season? Will the library be closed due to construction or maintenance during the period you are planning on coming? Are all its collections on site or does it need time to retrieve them from offsite storage? Whenever you request an item from a library, having its name and call number will speed up the process. Any library should allow you to search its online catalog, no matter where you live. Do you know if your family members, especially aunts, uncles, and grandparents, have yearbooks they would be willing to show to you? They might even share memories of their high school years and their friends. Don’t forget that many local libraries actively collect and also accept gifts of high school yearbooks. Each one that has been owned by a graduate has unique inscriptions by classmates and some may have the owner’s own notations. Public libraries located near where your relatives or ancestors lived may have their own such treasure troves from their local schools. Some may even have been given to them by your relatives or their friends. It’s worth checking. While you’re at it, don’t forget to look in your own attic, basement, or bookcase. 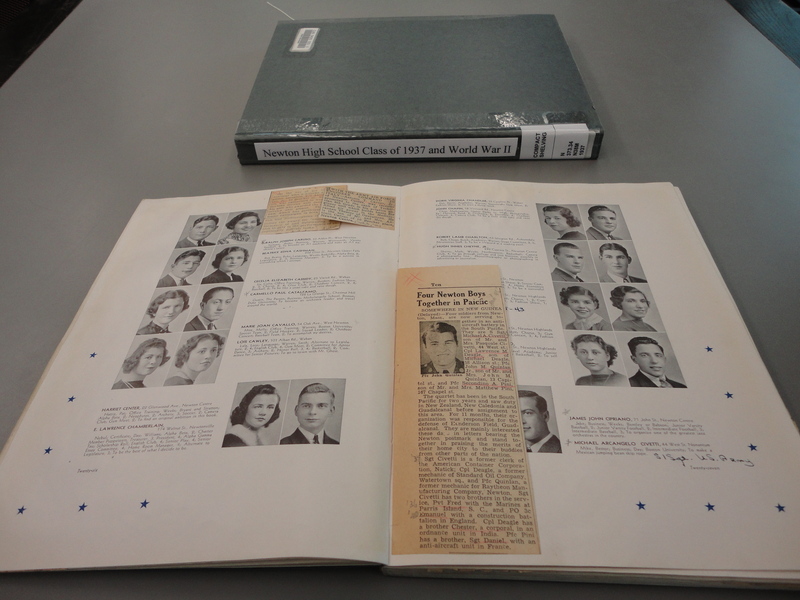 Do you have your parents’ or grandparents’ yearbooks? You might want to take a closer look at them. You never know when you’ll strike unexpected gold. And if you find them in the basement or attic, you might want to move them to a bookcase on your main floor. They’ll last longer. Good luck with your quest, wherever it takes you. 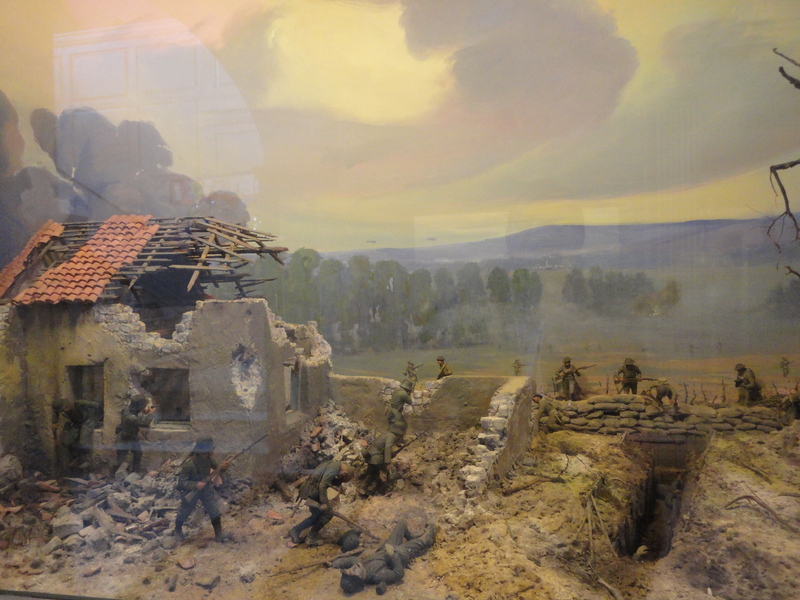 The following links are offered to help you find more information on the war that changed the world. In remembrance of the commencement of the Civil War in April 1861, and to commemorate Confederate History Month, Fold3 is offering free access to our Civil War Collection from April 1st–15th. Do I have any family memorabilia or artifacts (such as letters, weapons, medals, or photos) that hint at possible Civil War service? What about their tombstone? Does it have any insignia or other military symbols on it? Do any of the records or documents (such as obituaries) I’ve already found for an individual mention Civil War service? 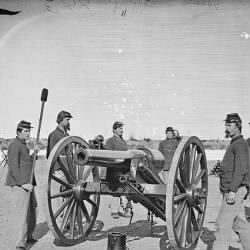 Start searching or browsing the Civil War Collection on Fold3. Or learn more about how to find your Civil War ancestors by watching a helpful course or tutorial on Ancestry Academy! The following is from Susan Laura Lugo, Territorial Archivist, DPNR/Division of Libraries, Archives and Museums, U.S. Virgin Islands. I am very pleased to announce the March 1, 2017, official launch of the searchable Web site by the Danish National Archives in commemoration of the March 31, 2017, Centennial observance of Transfer Day, the day on which the Danish West Indies were transferred to the United States of America as the Territory of the Virgin Islands of the United States. All researchers everywhere now have free, online access to over 5 million scanned images (over 8.5 million pages) of original documents, maps and drawings from the records of the Danish West Indies held by the Danish National Archives. Click on “Search the Records” at https://www.virgin-islands-history.org/en/ and a search screen will display. Scroll down on the landing page to make use of the excellent search tips and guides provided before entering your search terms. The Danish National Archives’ Web site, search guides and finding aids will also be linked this month from the Facebook page for the “VI Public Libraries DPNR” and from the Territorial Archives web page on www.virginislandspubliclibraries.org/archives.asp . The Territorial Archives within the Division of Libraries, Archives and Museums of the Department of Planning and Natural Resources of the Government of the Virgin Islands of the United States expresses its sincere thanks and gratitude to the Danish National Archives, the Danish Ministry of Culture, and A.P. Møller and Chastine Mc-Kinney Møller Foundation for General Purposes for supporting and carrying out this important digitization project to restore to the people of the Virgin Islands their Danish West Indian history and cultural heritage. NARA [the National Archives and Records Administration of the United States] has about 4.0 million pages (2,313 cf) of material in RG55 from the Danish West Indian era (see the finding aid at: http://www.virgin-islands-history.dk/nara/danmark1.pdf), and we still have some DWI records in the Territory (about 1,000 lf). Our hope is to provide access to ALL the records held across the US/DK/VI so that our history may be unified for the first time in over 100 years. Note on picture: It is from the Record Series Copybooks of Letters Sent to the King in the Danish West Indies Collection mentioned above. Are you related to the Metcalf family? Be sure to join us for the second in the series of special family research days at the Dedham Historical Society & Museum on February 4, from 1:00 – 4.00pm, when we focus on holdings that relate to the Metcalf family. Members of the Metcalf family were involved in the beginning of the Town of Dedham in 1636. 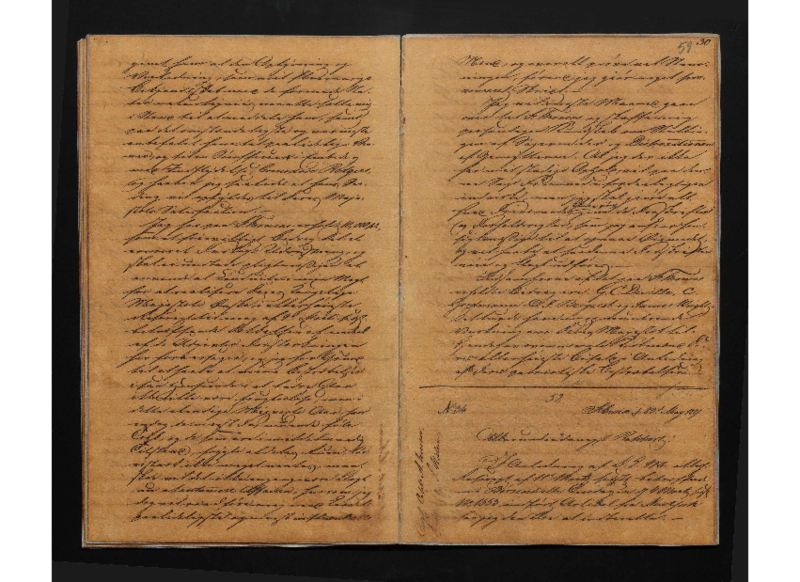 Featured research materials available for review include archival and genealogical records such as histories, wills, deeds, and other Metcalf manuscripts. 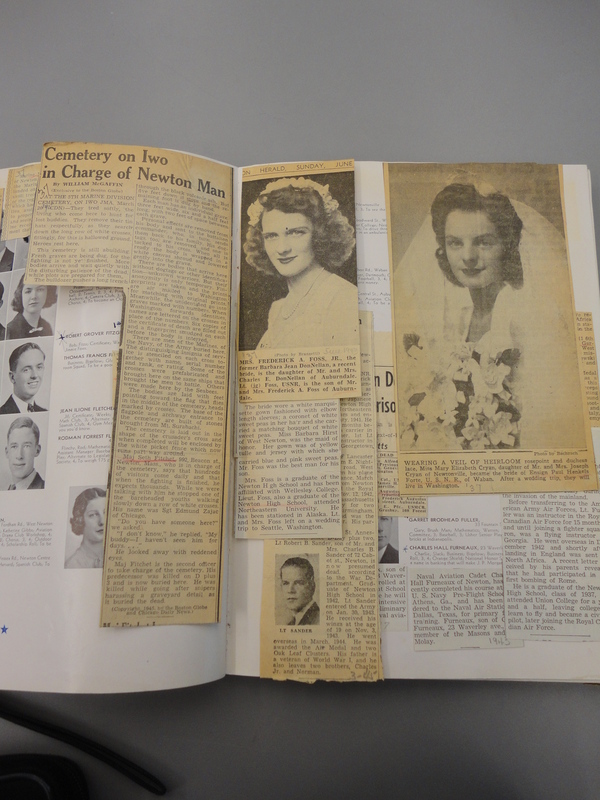 Also included are documents that have recently been added to the Metcalf family archival collection. This program is by appointment only. Please contact Sandra Waxman at 781- 326-1385 or library@dedhamhistorical.org to reserve a place. This program is free for members; $5 fee for non-members. As a special note; the historic 1652 Metcalf chair is always on view in the museum, as are a blanket chest, coat of arms, and clock, all related to the Metcalf family. The Dedham Historical Society & Museum hours are: Office is open Tuesday – Friday 9:00am – 4:00pm; Museum is open Tuesday – Friday 12noon – 4:00pm, and the Archive is available by appointment on Tuesday and Thursdays from 9:00am – 4:00pm. The Museum and Archives are also open on even dated Saturdays from 1:00 – 4:00pm. 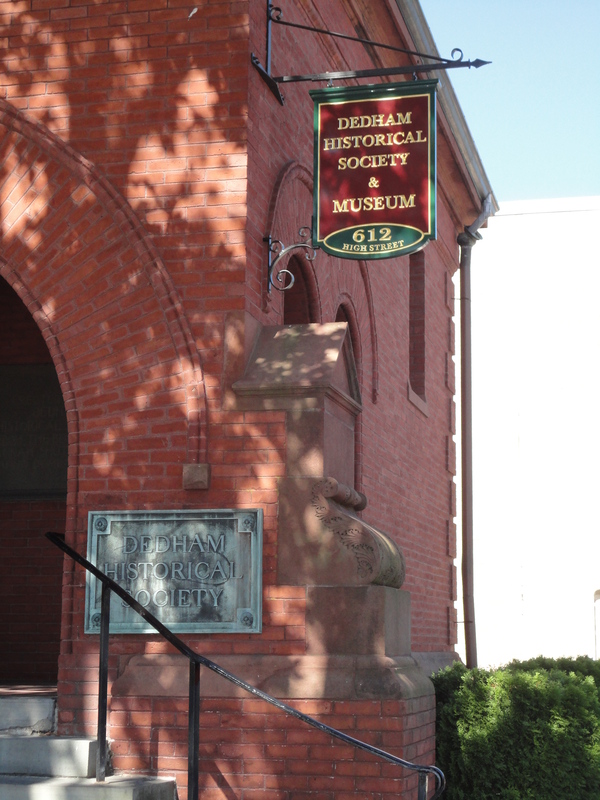 For more information about the Dedham Historical Society & Museum please contact them at 781-326-1385 or society@dedhamhistorical.org. The DHS is located at 612 High Street, Dedham.